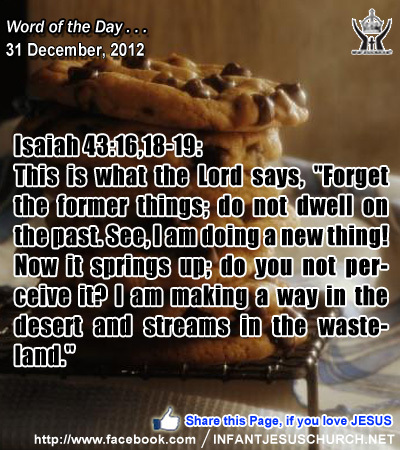 Isaiah 43:16,18-19: This is what the Lord says, "Forget the former things; do not dwell on the past. See, I am doing a new thing! Now it springs up; do you not perceive it? I am making a way in the desert and streams in the wasteland." Heavenly Father, thank you for year we going to end. Please help us to learn from our mistakes this past year, but not to dwell on them. Please help us not rest on our accomplishments in this past year, but use them to further your work in us and through us. Please help us not quarrel with those who injured us yesterday, last month, or this past year. Instead, Heavenly Father, lead us in your paths and help us see your mighty works this next year. In Infant Jesus' name we ask this. Amen. 1In the beginning was the Word, and the Word was with God, and the Word was God. 2He was in the beginning with God; 3all things were made through him, and without him was not anything made that was made. 4In him was life, and the life was the light of men. 5The light shines in the darkness, and the darkness has not overcome it.4In him was life, and the life was the light of men. 5The light shines in the darkness, and the darkness has not overcome it. 6There was a man sent from God, whose name was John. 7He came for testimony, to bear witness to the light, that all might believe through him. 8He was not the light, but came to bear witness to the light. 9The true light that enlightens every man was coming into the world. 10He was in the world, and the world was made through him, yet the world knew him not. 11He came to his own home, and his own people received him not. 12But to all who received him, who believed in his name, he gave power to become children of God; 13who were born, not of blood nor of the will of the flesh nor of the will of man, but of God. 14And the Word became flesh and dwelt among us, full of grace and truth; we have beheld his glory, glory as of the only Son from the Father. 15(John bore witness to him, and cried, "This was he of whom I said, `He who comes after me ranks before me, for he was before me.'") 16And from his fulness have we all received, grace upon grace. 17For the law was given through Moses; grace and truth came through Jesus Christ. 18No one has ever seen God; the only Son, who is in the bosom of the Father, he has made him known. Christians never end proclaiming anew the wonder of the Incarnation. The Son of God assumed a human nature in order to complete our salvation in it. The Son of God ...worked with human hands; he thought with a human mind. He acted with a human will, and with a human heart he loved. Born of the Virgin Mary, he has truly been made one of us, similar to us in all things except sin. If we are going to behold the glory of God we will do it through Jesus Christ. Jesus became the partaker of our humankind so we could be partakers of his divinity. God's purpose for us, even from the beginning of his formation, is that we would be fully integrated with Him. When Jesus comes God is made recognized as the God and Father of our Lord Jesus Christ. By our being united in Jesus, God becomes our Father and we become his sons and daughters. Do we thank the Father for sending his only beloved Son to redeem us and to share with us his glory? Almighty God and Father, your everlasting Word leaped down from heaven in the silent watches of the night. Open our hearts to receive his life and boost our vision with the rising of dawn, that our lives may be overflowing with his glory and his peace.